With the 2018-19 college basketball regular season winding down, there are a handful of teams that could wind up with a coveted No. 1 seed in this year’s NCAA tournament. While Duke (23-2), Tennessee (23-2), and Virginia (22-2) have each spent some time as the nation’s top-ranked team this season, their holds on a No. 1 seed in the tourney are not locked. The Vols won 19 games in a row before losing to Kentucky, which has moved up to No. 4 in the rankings. The two teams play once more before the season ends and the result of that game could determine which team gets a No. 1 seed. Gonzaga, which is 25-2 and ranked No. 2 in the nation, is certainly worthy of a No. 1 seed as well. The Bulldogs have lost only to Tennessee and No. 8 North Carolina. Head coach Mark Few’s team was a No. 4 seed last year and advanced to the Sweet Sixteen. Watch out for Nevada, which is currently 24-1 and is loaded with talent. A year ago, head coach Eric Musselman and company caught the nation by surprise and advanced to the Sweet Sixteen. The entire team returned along with transfer Jazz Johnson who has averaged 11.1 points a game this season. Head coach Kelvin Sampson is doing a fantastic job of turning around Houston. The Cougars are the cream of the American Athletic Conference. Houston owns the nation’s best record at 25-1 and the Cougars could be trouble in the NCAA tournament. Sampson’s defense allows opponents just 60.3 points per game. That makes Houston fifth-best in the nation. Duke’s tournament run likely depends upon the health of star Zion Williamson, who left the Blue Devils recent loss to North Carolina with a knee injury. The injury is not supposed to be serious, but there has been some talk that Williamson, expected to be the No. 1 selection in this year’s NBA draft, may not play again. The Tar Heels, led by Cameron Johnson (16.7 ppg) and Luke Maye (15.1 ppg, 9.8 rpg), have won nine of their last ten games, including the huge win at Duke. Head coach Roy Williams is just two years removed from UNC’s last national title and he has the talent to do it again. One thing the NCAA tournament is well known for is upsets. There will surely be a few in 2019. 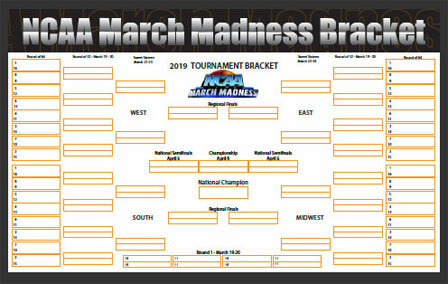 Teams like South Dakota State – featuring the nation’s fourth-leading scorer Mike Daum (25.8 ppg), and Murray State, which has Ja Morant (24.5 ppg, 10.2 apg) – could become this year’s Loyola-Chicago which advanced to the Final Four a year ago. If you are looking for a sure bet, look for last year’s national runner-up Michigan to reach the Sweet 16 (at the very least). Of the 10 previous national runners-up, nine of them have reached the Sweet 16 the following year. This year’s Wolverines have spent most of the season ranked in the Top 10 (currently No. 7 at 23-3). Head coach John Beilein’s team has the nation’s third-best defense allowing just 57.6 points per game. Texas Tech is another sleeper. The Red Raiders are 21-5 overall and ranked No. 14. Like Michigan, head coach Chris Beard’s team is strong defensively. Texas Tech is second to Virginia in points allowed per game (57.2). Beard took his team to the Elite Eight a year ago. Teams seeded No. 1 through No. 4 are more likely to earn a trip to the Final Four. Duke’s fabulous freshman make them the favorite despite Zion Williamson’s injury. Virginia, which became the first No. 1 seed to lose to a No. 16 seed in last year’s tournament, is a strong favorite to be a No. 1 seed again and to advance to a Final Four. A late-season surge by Kentucky has increased the likelihood that the Wildcats reach this year’s Final Four. Gonzaga, which played for the national title just two seasons ago, is also a favorite. Michigan State has been to seven Final Fours since Tom Izzo became the head coach in 1995. Duke is the overall favorite at +250 to win the 2019 national title.